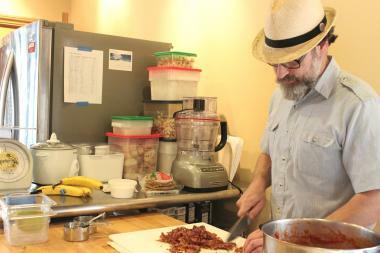 David Bryson, owner of Johnny Casserole, prepped a hot dish back in 2013. NORTH CENTER — The dog days of summer might not be the ideal time to order a hot dish, but fans of Johnny Casserole only have until the end of the month to get their fix of the restaurant's pot pies, lasagna and mac 'n' cheese. Owner David Bryson is pulling the plug on his two-year-old restaurant, 4019 N. Damen Ave., closing the doors for good Aug. 30. "Just didn't do enough sales to sustain the business there," Bryson said. For those who have room in their freezers, Johnny's is still accepting to-go orders, so stock up while you can (click here for menu). The stretch of North Center between Irving Park Road and Montrose had been on a roll with new restaurants of late. Via Lima, Lou Malnati's, Dos Ricco's and Rocks all opened within the past year, as well as Tavern on Little Fort. Now the last week has brought word not only of Johnny's closing, but Browntrout as well. Food for thought: While it's a myth that 90 percent of restaurants shutter in their first year, studies show more than half won't make it past the three-year mark. Poor location, concept, undercapitalization and the challenge for chef/owners to balance work/life demands are among the most oft-cited reasons for failure.